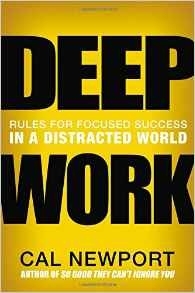 It's a useful resource on paying attention to your work, but doesn't say a ton beyond that. I'm not sure that over-optimizing for deep work is a great goal, either. It seems you should better be able to develop a flow of productivity. Fewer official work hours helps squeeze out the fat of the workweek, when you give yourself all day, you waste more time on things you don’t need to do (see Parkinson’s Law).